The combination of the chi dragons and the shou medallion seems to be an evolution in artistic design in the later part of the Qianlong reign. 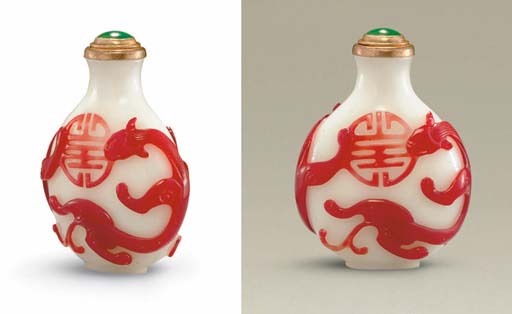 See a red overlay white glass snuff bottle with dragons surrounding a stylized shou character in the Bloch collection, illustrated in Moss, Graham, Tsang, A Treasury of Chinese Snuff Bottles, Vol. 5, Glass, no. 884.